NEW PRODUCT ANNOUNCEMENT FOR IMMEDIATE RELEASE: July 22, 2014 Contact: Alan Lowne, President, Saelig Co. Inc. Tel: (585) 385-1750 Email: info@saelig.com. Saelig Introduces 6GHz Handheld RF Spectrum Analyzers – versatile, easy-use, touch-screen RF tools with long battery life offer spectrum analysis in the palm of your hand. Fairport, NY, USA: Saelig Company, Inc. has introduced two new RF analyzers – the new AIM-TTi Series 5 Models (saelig.com/MFR00082/M00082003.htm) – available in 3.6GHz and 6.0GHz versions. They maintain a true handheld format while offering bench-top instrument-quality features. The PSA3605 and PSA6005 weigh just 560 grams and are small enough to fit comfortably into the hand and provide more than 3 hours of operation from each charge of the built-in lithium-ion battery. Despite their compact dimensions, these analyzers incorporate a large high resolution color TFT display with touch screen control. The Series 5 is all-digital from the second IF onwards. This enables it to offer a full range of RBW/VBW (resolution bandwidths/video bandwidth) settings, multiple detector modes, and advanced features such as waveform demodulation and automatic measurements. The large 4.3” TFT color touch-screen provides a high resolution display, and an intuitive menu system that makes set-up fast and easy. The PSA Series 5 is physically similar to the highly successful PSA Series II, with a case that includes rubberized buffers for shock protection and a built-in screen protector for field use. It employs the same advanced filing system with USB interfaces for external flash drives and direct PC connection, and its digital processing features provide it with a full range of resolution bandwidths from 300Hz up to 3MHz (1-3-10 sequence) and multiple detector modes. Signal demodulation for AM and FM extends to a time-domain display in addition to audio demodulation. Advanced functions inherited from the Series II include data logging for up to 25,000 results per file, and complex limit lines and patterns combined with a limits comparator. The PSA Series II – the previous range of successful traditional super-heterodyne analyzers – used analog filters to define RBWs. With this approach, issues of cost and power were limitations on frequency range and functionality. The new PSA Series 5 uses advanced digital techniques to provide both higher frequency range and wider functionality. The Displayed Average Noise Level (DANL) noise figure is better than -160dBm/Hz and a minimum full scale reference level of -40dBm allows signals down to -120dBm to be seen. RBW and VBW are adjustable from 300Hz to 10MHz in 1:3:10 sequence. Multiple traces can be displayed in contrasting colors, and trace modes include peak hold and multi-sweep averaging. Large internal storage is provided for traces, setups and complete screen images. Connectivity is provided for USB flash drives and for direct USB connection to a PC. Internal storage extends to nearly 2GB, and the internal filing system supports user specified names and time stamping from a real-time clock. Additional features include automatic measurements of Channel Power (CP), Adjacent Channel Power Ratio (ACPR) and Occupied Bandwidth (OBW), and waveform demodulation. The new PSA Series 5 Analyzers supplement the widely adopted PSA Series 2 which is available in 1.3GHz and 2.7GHz versions. The PSA Series 5 offers RF service engineers and wireless product technicians a cost-effective and highly portable tool, placing a spectrum analyzer in areas that are difficult to access with bench top instruments. 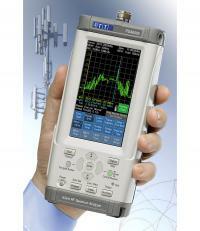 Bench-bound engineers will appreciate the low cost of PSA Series 5 RF Spectrum Analyzers, enabling them to justify the purchase of an RF spectrum analyzer for a wide range of tasks, while wireless audio technicians will benefit from instant displays of free audio WiFi channels or problematic interference. The compact, handheld PSA Series 5 RF Spectrum Analyzers weigh only 560 grams (20oz) and are just 9.2cm (3.6”) wide, making them suitable for any portable RF service kit.